Pronounced “Tayler”… For thousands of year the ancient Reishi physicians and Masters of Ayurveda and Yoga Therapy have relied on external tools to assist them in therapeutically managing energy disturbances to the Mind, Spirit and Bodies of their patients and clients, their friends and family members. We continue this practical approach to healing and therapy today. SomaVeda® TAELR™ is especially suitable For Trigger Point Syndromes caused by disruptions and or disturbances to energy lines. The SomaVeda® TAELR™ tool set includes many traditional and modern innovative methodologies to bring harmony and correction for low oxygen significant traumatic and metabolic induced disorders and syndromes. Traditional SomaVeda® TAELR™/ IASTM (Instrument Assisted Soft Tissue Massage) tool/ instruments include but are not limited to “Tok Sen, Dewy Mai Sen, Gua Sha (Thai Acupressure/ “Jap Sen Nuad, Tok Sen Nuad“), Cupping, Bamboo Stick, Roller, Whisk” etc. Reduction of pain, increase in range of motion, reduction in referral pains such as migraines and back pain may be significant and immediate. Perfect for Sports and work related injuries and dysfunction. We use all of the traditional tools and modern versions as well: Wooden, Buffalo Horn, Jade, Plastic and Stainless steel. 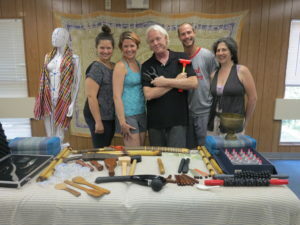 TAELR™ Therapeuticians also use various styles of Hammers, and Probes in the striking, vibration and or striking techniques which are common as well. Pain Syndromes: Acute and or Chronic… Especially Back, Neck, Hip, Shoulder, Knee, Ankle, Wrist pain. Any chronic pain located in or near a joint. Chronic Inflammation, both general and localized. Reducing Facial restrictions and or Scar tissue which interferes with healthy and productive function such as Post Surgical and Traumatic Scars. However Physiopedia although correct is incorrect to ascribe the use of tools in therapy exclusively to traditional Chinese Medicine! Using tools in medical therapy is first recorded in the classics of Indian and Thai Ayurveda … the Sushruta Samhita recorded Ayuvedic Physician using a great variety of instruments to supplement the use of their bare hands over four thousand years ago. In our indigenous traditional way of thinking we make no defined distinction separating the body into physical and or energetic quanta. We see no clear distinction at all. Fascial Planes= Energy Lines and vise versa. Additionally in the western variations there is little or no emphasis on the traditional Hammer and Probe type of technique which is consider vital in our traditional medicine. This treatment strategy and protocol is useful for therapist who are seeking to use their hands less as the primary tools or expression of their healing arts… Through the use of the various instruments one may do entire sessions and treatments Hands Free! In this course we introduce and explain all of the traditional tools used in TAELR™ practice and with live demonstration practice exchanges building application competencies. Students through lecture and in-class learning environment improve understanding of indications, contraindications and clinical applications for common conditions and issues. Additionally, students are introduced to the protocol as a form of Complimentary and Integrative Medicine Practice in the context of a modern Religious Therapeutic modality suitable for ministers of traditional medicine practice. In the SomaVeda® TAELR™ Certification Course the practitioner receives certification as a Certified SomaVeda® TAELR™ Technician. We introduce the SomaVeda® TAELR™ protocol in the Ayurveda LifeStyle Consultant (CTP2) module. Further training is offered in the Ayurveda Health Counselor and SomaVeda® Yoga Therapist and Teacher Certification Certification Programs. Advanced training is offered once a year in Brooksville, FL at the Thai Yoga Center during the Annual Advanced and Teacher Conference and twice a year during our ongoing programs in Thailand (December and April annually).